Seemingly Silly Swashbuckling Centered on Semantics? 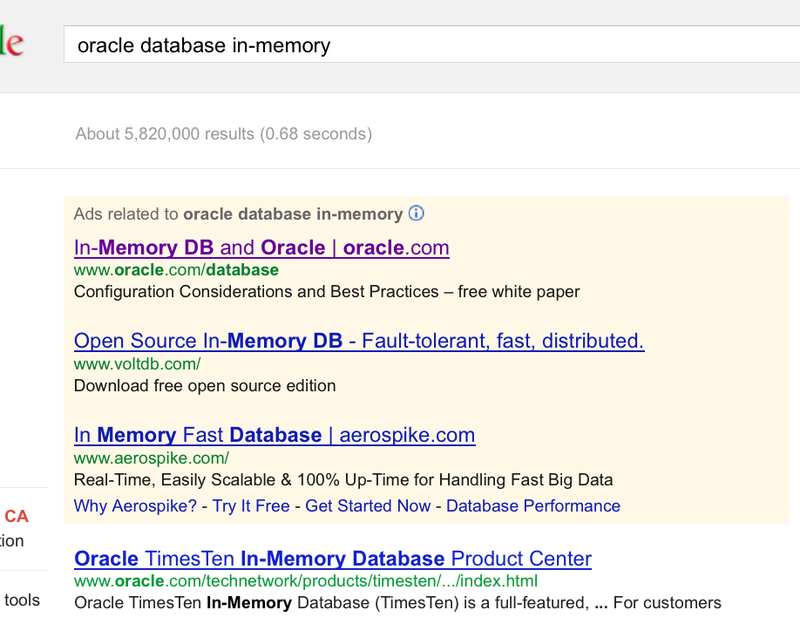 So, yes, a little way down the page I see a link to webpage about Oracle’s freshly-minted term: “Database In-Memory”. I’ve read several articles covering the X3 hardware refresh of Oracle Exadata Database Machine and each has argued that Oracle Real Application Clusters (RAC), on a large-ish capacity server, does not qualify as “in-memory database.” I honestly don’t see the point in that argument. 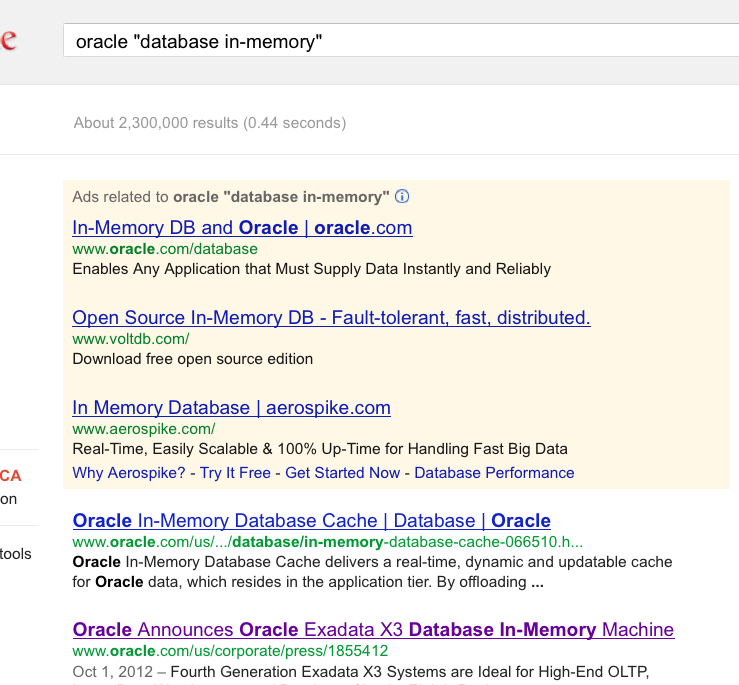 Oracle is keenly aware that the software that executes on Exadata is not “in-memory database” technology. That’s why they wordsmith the nickname of the product as they do. But that doesn’t mean I accept the marketing insinuation nor the hype. Indeed, I shouldn’t accept the marketing message–and neither should you–because having the sacred words “in-memory” in the nickname of this Exadata product update is ridiculous. I suspect, however, most folks have no idea just how ridiculous. I aim to change that with this post. I’m horrible at drawing, but I need to help readers visualize Oracle Exadata X3 Database In-Memory Machine at a component level. But first, a few words about how silly it is to confuse Exadata Smart Flash Cache with “memory” in the context of database technology. But A Bunch Of PCI Flash Cards Qualify As Memory, Right? …only out of necessity when playing word games. I surmise Oracle needed some words to help compete against HANA–so why not come up with a fallacious nickname to confuse the fact? Well, no matter how often a fallacy is repeated it remains a fallacy. But, I suppose I’m just being pedantic. I trust the rest of this article will convince readers otherwise. If PCI Flash Is Memory Why Access It Like It’s a Disk? …because the flash devices in Exadata Smart Flash Cache are, in fact, block devices. Allow me to explain. The PCI flash cards in Exadata storage servers (aka cells) are presented as persistent Linux block devices to, and managed by, the user-mode Exadata Storage Server software (aka cellsrv). In Exadata, both the spinning media and the PCI flash storage are presented by the Linux Kernel via the same SCSI block internals. Exadata Smart Flash Cache is just a collection of SCSI block devices accessed as SCSI block devices–albeit with lower latency than spinning media. How much lower latency? About 25-fold faster than a high-performance spinning disk (~6ms vs ~250us). 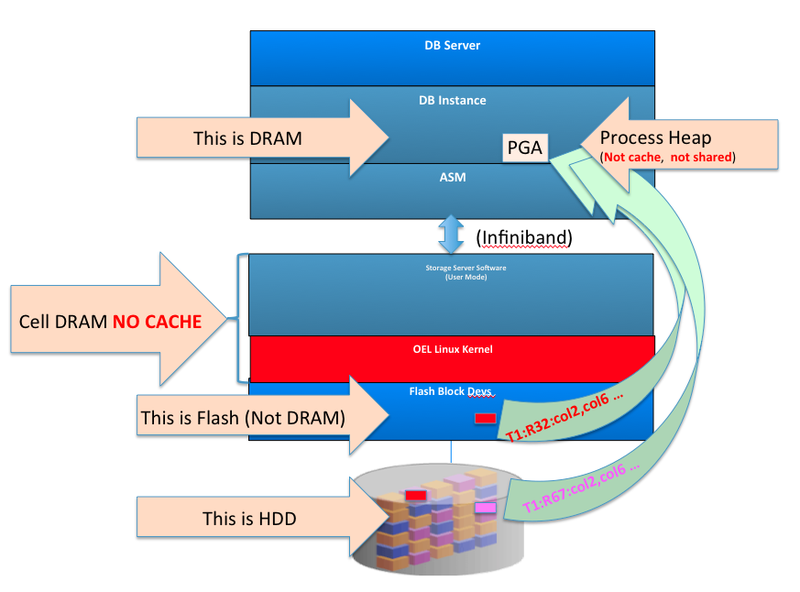 Oh, but wait, this is a blog post about “Database In-Memory” so how does an 8KB read access from Exadata Smart Flash Cache compare to real memory (DRAM)? To answer that question one must think in terms relevant to CPU technology. The following drawing shows a high-level component breakout of Exadata X3-2. There are two “grids” of servers each having DRAM and Infiniband network connectivity for communications between database hosts and to/from the “storage grid.” Each storage server (cell) in the storage grid has spinning media and (4 each) PCI flash cards. The cells run Oracle Linux. Exactly When Did Oracle Get So Confused Over The Difference Between PCI Flash Block Devices And DRAM? In late 2009 Oracle added F20 PCI flash cards as a read-only cache to the second generation Exadata known as V2–or perhaps more widely known as The First Database Machine for OLTP[sic]. Fast forward to the present. The X3-2 model tops out at 2TB of aggregate DRAM (8 hosts each with 256GB) that can be used (minus overhead) for database caching (up from 1152 GB in the X2 generation). The X3-8, on the other hand, offers an aggregate of 4TB DRAM for database caching (up from the X2 limit of 2TB). To that end the ratio of flash block device capacity to host DRAM is 11:1 (X3-2) or 5.5:1 (X3-8). This ratio matters because host DRAM is where database processing occurs. More on that later. Long before Oracle became confused over the difference between PCI flash block devices and DRAM, there was Oracle’s first Database In-Memory Machine. Allow me to explain. In the summer of 2009, Oracle built a 64-node cluster of HP blades with 512 Harpertown Xeons cores and paired it to 2TB of DRAM (aggregate). Yes, over three years before Oracle announced the “Database In-Memory Machine” the technology existed and delivered world-record TPC-H query performance results–because that particular 1TB scale benchmark was executed entirely in DRAM! And whether “database in-memory” or “in-memory database”, DRAM capacity matters. After all, if your “Database In-Memory” doesn’t actually fit in memory it’s not quite “database in-memory” technology. Oracle Database has offered the In-Memory Parallel Query feature since the release of Oracle Database 11g R2. So if Database In-Memory technology was already proven (over 3 years ago) why not build really large memory configurations and have a true “Database In-Memory? Well, you can’t with Exadata because it is DRAM-limited–most particularly the X3-2 model which is limited to 256GB per host. On the contrary, every tier-one x64 vendor I have investigated (IBM,HP,Dell,Cisco,Fujitsu) offers 768GB 2-socket E5-2600 based servers. Indeed, even Oracle’s own Sun Server X3-2 supports up to 512GB RAM–but only, of course, when deployed independently of Exadata. Note: this contrast in maximum supported memory spans 1U and 2U servers. So what’s the point in bringing up tier 1 vendors? Well, Oracle is making an “in-memory” product that doesn’t ship with the maximum memory available for the components used to build the solution. Moreover, the Database In-Memory technology Oracle speaks of is generic database technology as proven by Oracle’s only benchmark result using the technology (i.e., that 1TB scale 512-core TPC-H). OK, OK, It’s Obviously Not The “Oracle Exadata X3 Database In-DRAM Machine” So What Is It? That’s right. 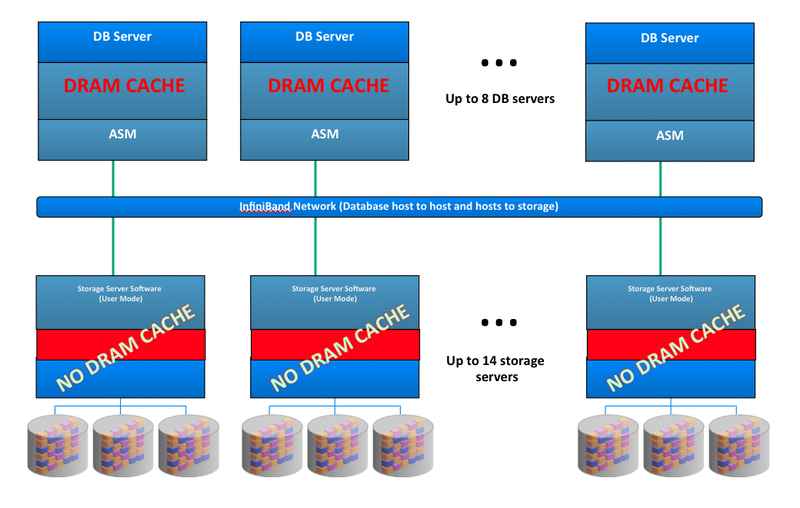 There has never been DRAM cache in the storage grid of Exadata Database Machine. The storage grid servers’ (cells) DRAM is used for purposes of buffering and the metadata managing such things as Storage Index and mapping what HDD disk blocks are present (copies of HDD blocks) in the PCI flash (Exadata Smart Flash Cache). Yes, the aggregate (22TB) Exadata Smart Flash Cache is now known as “Database In-Memory” technology. Please don’t be confused. That’s not PCI flash accessed with memory semantics. No, that’s PCI flash accessed as a SCSI device. There’s more to say on the matter. Please examine the following drawing. Label #1 shows where Oracle Database data manipulation occurs. Sure, Exadata does filter data in storage when tables and indexes are being accessed with full scans in the direct path, but cells do not return a result set to a SQL cursor nor do cells modify rows in Oracle database blocks. All such computation can only occur where label #1 is pointing–the Oracle Instance. The Oracle Instance is a collection of processes and the DRAM they use (some DRAM for shared cache e.g., SGA and some private e.g., PGA). No SQL DML statement execution can complete without data flowing from storage into the Oracle Instance. That “data flow” can either be a) a complete Oracle database disk blocks (into the SGA) or b) filtered data (into the PGA). Please note, I’m quite aware Exadata Smart Scan can rummage through vast amounts of data only to discover there are no rows matching the SQL selection criteria (predicates). I’m also aware of how Storage Indexes behave. However, this is a post about “Database In-Memory” and Smart Scan searching for non-existent needles in mountainous haystacks via physical I/O from PCI block devices and spinning rust (HDD) is not going to make it into the conversation. Put quite succinctly, only the Oracle Database instance can return a result set to a SQL cursor–storage cells merely hasten the flow of tuples (Smart Scan is essentially a row source) into the Oracle Instance–but not to be cached/shared because Smart Scan data flows through the process private heap (PGA). Exadata X3: Mass Memory Hierarchy With Automatic What? Sounds Like Tiering. the Oracle Exadata X3 Database In-Memory Machine implements a mass memory hierarchy that automatically moves all active data into Flash and RAM memory, while keeping less active data on low-cost disks. A block of data read from disk can be automatically copied into flash when read for the first time. 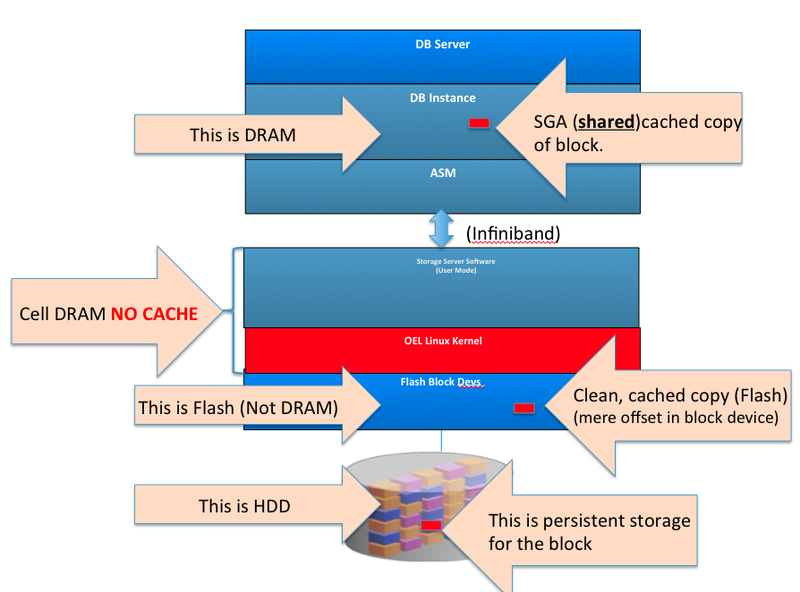 If a block of data is not being accessed by an Exadata Smart Scan the entire block is cached in the host DRAM (SGA). Remember the ratios I cited above. It’s a needles-eye situation. If a block of data is being accessed by an Exadata Smart Scan only the relevant data flows through host DRAM (PGA) but is not cached. In other words, “Copies” != “moves” and “keeping” insinuates tiering. Exadata does neither, it copies. Copies, copies, copies and only sometimes caches in DRAM (SGA). Remember the ratios I cited above. Where Oh Where Have All My Copies Of Disk Blocks Gone? 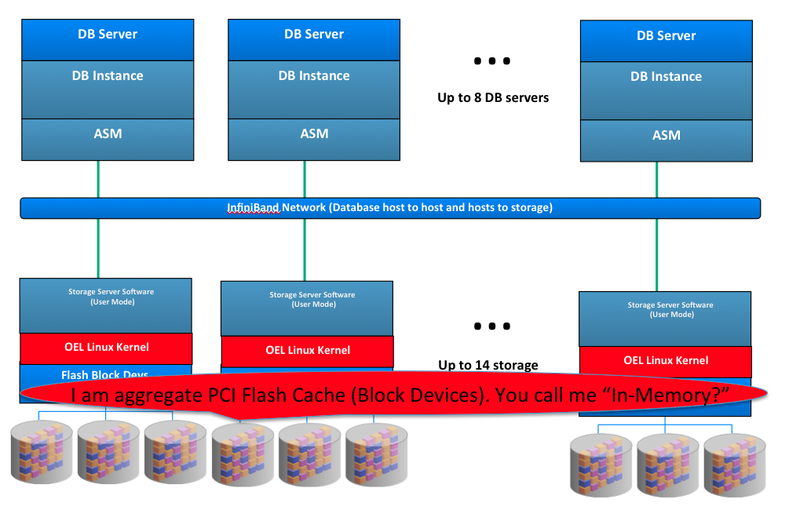 The following drawing is a block diagram that depicts the three different memory/storage device hierarchies that hold a copy of a block (colored red in the drawing) that has flowed from disk into the Oracle Instance. The block is also copied into PCI flash (down in the storage grid) for future accelerated access. Upon first access to this block of data there are 3 identical copies of the data. Notice how there is no cached copy of this block in the storage grid DRAM. As I already mentioned, there is no DRAM block cache in storage. Yeah, I’ve heard that one too. The following drawing shows the flow of data from a Smart Scan. The blocks are being scanned from both HDD and flash block devices (a.k.a Smart Flash Cache) because Exadata scans Flash and HDD concurrently as long as there are relevant copies of blocks in flash. Important to note, however, is that the data flowing from this operation funnels through the non-shared Oracle memory known as PGA on the database host . The PGA is not shared. The PGA is not a cache. The effort expended by the “Database In-Memory Machine” in this example churns through copies of disk blocks present in flash block devices and HDD to produce a stream of data that is, essentially, “chewed and spat out” by the Oracle Instance process on the host. That is, the filtered data is temporal and session-specific and does not benefit another session’s query. To be fair, however, at least the blocks copied from HDD into flash will stand the chance of benefiting the physical disk access time of a future query. The fundamental attributes of what the industry knows as “in-memory” technology is to have the data in a re-usable form in the fastest storage medium possible (DRAM). I’m not nit-picking the semantic differences between “in-memory database” and “database in-memory” because as I pointed out already Oracle has been doing “Database In-Memory” for years. I am, however, going to offer a synopsis of what is involved when Oracle Exadata X3 Database In-Memory Machine processes a block in an OLTP/ERP-style transaction. After all, Exadata is the World’s First Database Machine for OLTP and now that it is also Database In-Memory technology it might interest you to see how that all works out. Oracle have given yet another nickname to the Exadata Database Machine. The nickname represents technology that has been proven outside the scope of Exadata even 3 years ago. 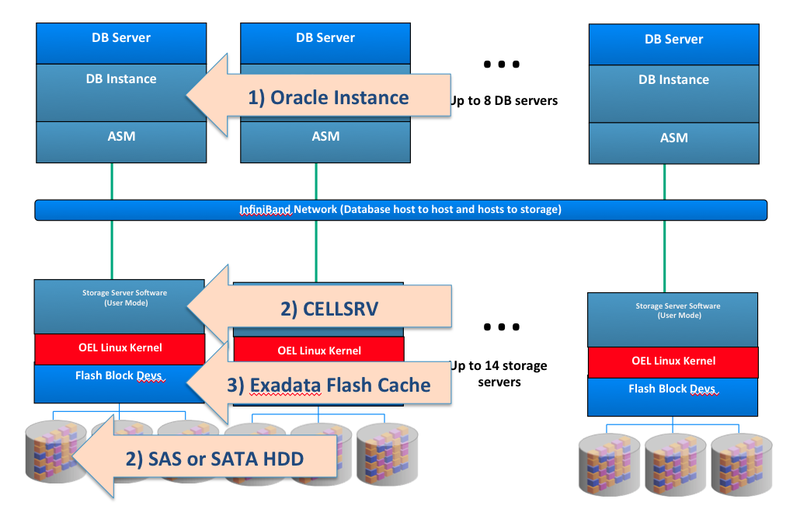 Oracle’s In-Memory Parallel Query feature is not Exadata-specific and that is a good thing. After all, if you want to deploy a legitimate Oracle database with the “database in-memory” approach you are going to need products from the best-of-breed server vendors since they’ve all stepped up to produce large-memory servers based on the hottest, current Intel technology–Sandy Bridge. This is a lengthy blog entry and Oracle Exadata X3 Database In-Memory Machine is still just a nickname. 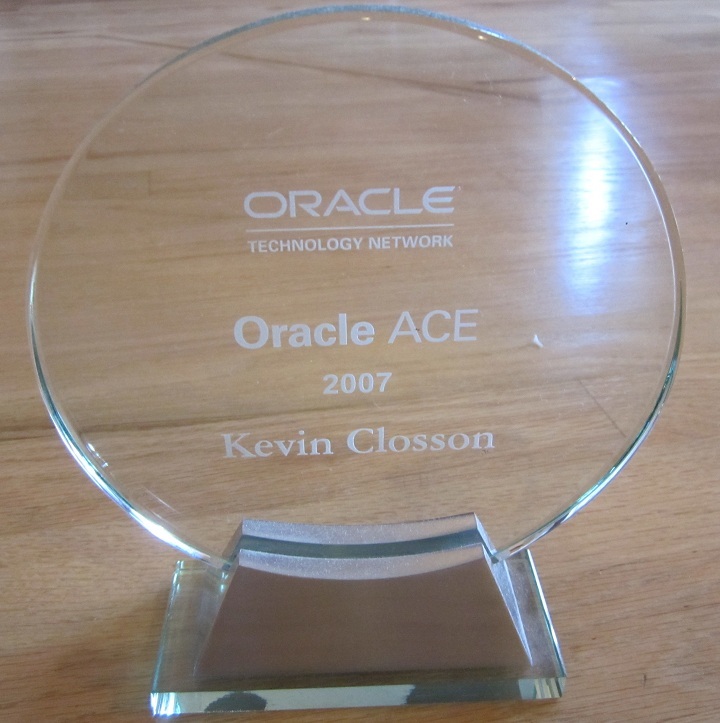 You can license Oracle database and do a lot better. You just have know the difference between DRAM and SCSI block devices and choose best of breed platform partners. After all those of us who are involved with bringing best of breed technology to market are not confused at all by nicknames. 25 years of Oracle and platforms experience. I didn’t just fall off the turnip truck. Exadata uses RDS (Reliable Datagram Sockets) with is OFED Open Source. The Synopsis of an Oracle-flavored “In-Memory” operation is centered on my understanding of RDS. You too can be an expert at RDS because it is Open source. In other words, this is all public domain knowledge assembled for your convenience. Thanks for the great post, Kevin. Never underestimate Oracle marketing’s capacity to redefine reality, even if it means shooting their collective feet off! The only value I see in their engineered systems is the ability to have a near optimal pre-configured hardware system with all needles pointing in the same direction. Instead of fighting three or four internal empire builders to get max performance specs on all layers: storage, transport, network, CPU, memory. Not an easy task, in my long experience of these things. On another note: there is a lot of value with EMC-FAST. But for example in a DW/ETL, large sequential batch processing situation, I fail to see how FAST can be of any help – other than forever chase behind where the real load is. It doesn’t predict load – it follows it. Note: that hasn’t stopped the local EMC rep from flogging it to our site! Instead of concentrating on more immediately useful matters like getting ALL of our servers on 8Gbps FC-cards to match the 8Gbps ports of our VMAX. Small details like these can have a huge impact on overall DW/ETL bandwidth capacity as opposed to OLTP-oriented IOPS – mostly useless for batch, sequential data processing. I’d just like the exaggerations to subside long enough for us to catch our breath. On the load prediction: That would be DBclassify from EMC. It works with FAST to move parts of the database to a higher tier when needed. “when needed” cannot possibly happen with a load that is essentially cyclic and sequential in nature. By the time it detects “when needed”, the database load is somewhere else and won’t come back in another 24-hours. Hence, a waste of time and resources for DW ETL workloads. The big point you make here seems to be that Oracle is claiming their machine is in-memory but you say it is not because only DRAM is memory. You cite a google search of in-memory databases to prove your point. I just did a Google search of “Flash Memory” and came up with 164 million hits. It appears a lot of people other than Oracle consider flash to be a memory technology. Flash chips certainly look a lot more like memory chips than they look like disk drives to me. I think Oracle’s point is that most data now fits in-memory (either flash or DRAM) and memory is a lot faster than disk therefore the database is now faster than it was when it was on disk. That seems like a very simple and very valid point. Beyond the point about flash not being memory (despite millions of references to that effect), the other part of this seems to be saying that accessing flash as blocks across a network is a poor architecture because it is not as fast as accessing local DRAM chips. Why not just take this argument to it’s logical conclusion and say that accessing DRAM is a poor architecture since on-chip cache is so much faster. That argument seems to have the exact same fallacies as the flash argument. There is nothing logical about that comment nor is that any sort of logical conclusion to my argument. Processor cache is not memory. The corollary, however, would be Oracle to use the nickname “Database In-Processor Cache” and pile on a synopsis-worthy amount of overhead. I nearly didn’t let your comment through moderation based solely on your insinuation that the extent of my knowledge on the matter centers on that fun little google search angle at the begging of the post. However, I think your comment deserves discussion. You apparently didn’t read the synopsis of a “Database In-Memory” block access at the bottom of the post. I’m clearly not splitting hairs over the ever-morphing definition of the word “memory.” I let your comment through moderation because I suspect others might miss the point. What point? The entire point of this post is the synopsis of a “Database In-Memory” block access at the bottom of the post. Give that a fresh read and see if you still think I’m splitting hairs. If you do think I’m still splitting hairs then please tell all of us what else Oracle can plop into the access path for a block of “Database In-Memory” storage. Could Oracle shovel in a few more intra-node blocking IPC requests and still get the wool over your eyes? Maybe they could chisel the address of the block in stone and roll it over on a log and let cellsrv take a glance so it knows what block to fetch? Maybe I’m missing the point. I’m willing to accept that. Perhaps the state of the art is to see how much high-latency overhead Oracle can put in the path of a block access and still get some folks to accept the term “Database In-Memory.” So, please, tell us. And that is exactly what Oracle (Larry Ellison) said at OOW last October. He didn’t say it’s an in-memory database, but stated that by replacing hard disks with either RAM, flash disks or SSD (and in third instance on the 500Gb disk array for ‘cold’ data) the database (or rather: datafiles and cachefiles) fits in memory (memory chips). This is faster than on a SAN or local disks. True, it’s a marketing term (what isn’t with products from a commercial enterprise? ), but this article makes it look like Oracle promises something completely different. Just play back Larry’s keynote from OOW. I was there and there is no confusion in my mind about what he meant. I urge you learn the basic fundamentals about Exadata and also to re-read this post. 1) HDD is not replaced in Exadata. Please re-read this post and look at the drawings. 2) You state “SSD” in your reply. There is no SSD in Exadata. 4) All data in Exadata persists on HDD whether ‘cold’ or hot. 5) Regarding “fits in memory (memory chips)”, that is only the case in Exadata when a database happens to be small enough to be cached in Exadata Smart Flash Cache and even then, I’ll reiterate the fact that all data persists on HDD. 6) “This” is not faster than accessing a block in a “SAN” (enterprise storage with tiering) where hot data is promoted to a persistent location on EFD and, if really hot, resides in the array controller DRAM cache. Contrast the “synopsis of a block access” in this post to a non-Exadata (e.g., skgfr()) read from an enterprise array or a flash array. This post is not a word game about a word game. @kevin, you’d be wrong in stating ‘all data persists on disk’. A hot block being written to can stay in flash forever without being destaged to disk. Check your facts. I used to enjoy this blog but now it has become an Oracle hatefest. Please revert to extolling the benefits of whatever is that you believe now; Greenplum. The value of Greenplum is not rooted in dissing Oracle. I haven’t seen you write about the finer aspects of Bizgress/Postgress. I want to hear your perspective on that, really. > kevin, you’d be wrong in stating ‘all data persists on disk’. A hot block being written to can stay in flash forever without being destaged to disk. Check your facts. You, Anantha, do not appear to know the definition of the word persists as it pertains to Exadata. Do you aim to argue the fact that every block of data in an Oracle database stored in Exadata does not, in fact, have multiple copies of said block spinning on round-brown disks across multiple storage cells? I did not mention de-staging in this post because it is off-topic. The topic is Database In-Memory. But since you bring it up, let’s discuss. If the database is small enough to fit in the Exadata Smart Flash cache then, sure, dirty blocks (and multiple versions of same) can remain in Exadata Smart Flash Cache indefinitely. Do you recommend Oracle customers buy a solution that has 168 spinning disks so they cache a 22TB database (the size of the aggregate Exadata Smart Flash Cache)? After all, if it doesn’t all fit in flash cache there will be replacement (including de-staging if dirty). Anantha, Exadata PCI flash is used for accelerating datafile reads and writes and redo. LRU is going to cause de-staging. That, however has nothing to do whatsoever with the topic of this post which is Database In-Memory. For what it’s worth, I don’t hate Oracle. I despise a good deal of their go-to-market policies, over-selling and product marketing gaffes. If you have children I presume you don’t hate them when they misbehave. It’s quite similar. I allowed your vitriolic second paragraph through my moderation. That will be the last time though. Kevin, I’m quite interested to read up about the case when the data is NOT written to spinning saucers. Are you aware of any official Oracle docs that describe how that works black-n-white? If only engineers would actually stick to the the engineering approach of RTFM rather than relying on hearsay, marketing and various gurus (e.g. *cough* Donald Burleson *cough*) the world would be a much better place. Andrew: All data is “homed” on round spinning stuff in Exadata. The write cache of Exadata serves as nothing more than a delayed write to HDD. The delay can be arbitrarily long in duration as the data is protected due to ASM redundancy and the flash devices are persistent. As soon as demand pushes aged blocks out of the flash cache they are written to HDD. Once flushed (de-staged) to HDD only the primary mirror copy lingers (in a clean state) in the cache and all other flash copies (remember ASM normal or high redundancy) are invalidated. This is fine because ASM only reads the primary copy of mirrored ASM blocks. It doesn’t round-robin like traditional volume managers (e.g., VxVM plex reads). @Kevin, I was not arguing the ‘in-memory’ aspects at all, you’re misreading my comment. It simply corrected a mistake in a sentence that stated data persists to disk. As implemented in X3, disk becomes a backing store for flash. Like all other IT vendors Oracle is not foreign to exaggeration, they’re actually good at it 😉 I don’t pay much attention to marketing. That’s the reason I visit blogs like yours to learn. Regardless, you must admit the change in your articles. All I’ve to do is to read this very blog circa 2010 or 2011. I understand people change as new technologies emerge. However the tone and content of your blogs have changed, it used to be enlightening to read it. But now it is not. “[…] mistake in a sentence that stated data persists to disk” and who wrote that sentence? You lost me. I was trying to verify this algorithm because I don’t see it mentioned any where in the documentation and it seems to me that it means that effective available cache should be reduced by the amount of dirty blocks in flash cache ( as there are two copies ). Unfortunately 1) cellcli does not seem to display a dirty flag. 2) I assume the only way to figure out a lot of this is from ASM. IS there any published material on the way this works ? Thanks a lot for taking your time to write such a facinating post. As I was reading, I felt like a litle 8K block going through the loops, twists and chains all the way form the Flash Cash to the Buffer Cache. It is always important to hear all sides of the story. I presume your post is going to make some considerable noise around the Oracle comunity. Hi Kevin and thank you for this interesting post. I am an IT professional but not as technical as some, so to me your pictures painted a thousand words. I have recently researched SAP HANA and it may assist other readers if you compare the HANA architecture with Exadata as to my understanding HANA is a true In-memory database that only uses HDDs for data persistence when powered off. You did make a passing mention of HANA, but a picture comparison might be useful. allocated explicitly with an instruction or implicitly by the programming language as the result of an instruction. device includes some RAM we would not rationally use the words “in-memory” to describe a program that uses the device. For example, a SAN device has loads of RAM onboard… But when I take my program that has been using a HDD and point it to a SAN device I would not now call my program an in-memory technology. The Exadata database program is RAC. Exadata extends RAC adding a shared storage subsystem network-attached to the RAC layer. It is, from an engineering perspective, a purpose-built SAN. It fact, it is a SAN from Oracle’s perspective as well… Which is why its performance was compared to EMC SAN when Exadata X3 was introduced. develop an in-memory software technology. How can data-on-SAN be data-in-memory in any reasonable use of the term? IMHO it is fair for Kevin to call out misleading language AND point out the engineering realities. I think it is every bit as important for consumers to pay attention to words..in fact, even more so than engineers. Engineers know when marketing are stretching the truth. A consumer, on the other hand, may not. I aim to help the IT consumer. Since the acquisition of Sun, Oracle’s marketing claims have routinely swollen well beyond the point of absurdity. I merely aim to provide factual information to help folks cut wheat from chaff as it where. 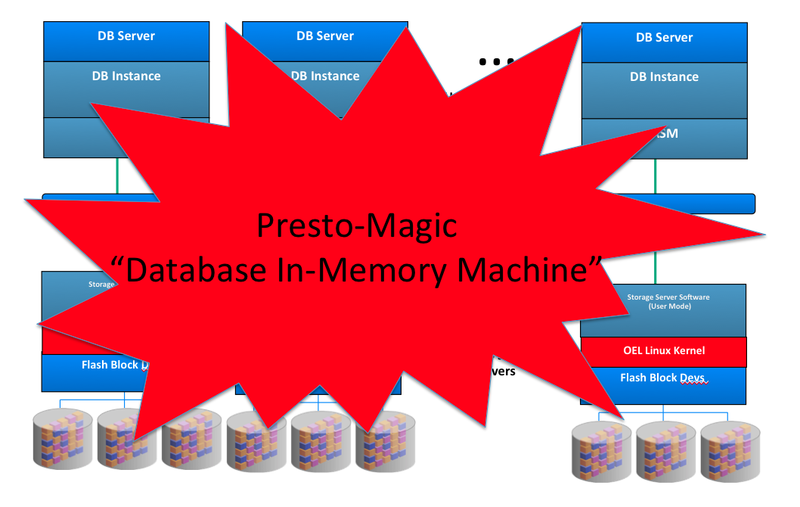 Word-gaming like “Database In-Memory” deserves scrutiny. Excellent work again Kevin. Oracle is evolving into the EF Hutton of Database management. Where if they say it must be true. In-memory functions are vastly different than the traditional “block & tackle” storage IO that Oracle RDBMS still uses today. And by extension Exadata Storage Cells. Thanks you very much for the great and very detailed post. P.S. It’s funny to read comments of Oracle’s zealots which have a butthurt every time when someone dispels another marketing hype of Oracle. given the fact that the flash memory is managed at the linux level as a block device can’t the DBA explicity allocate it, using ASM, as if it was a regular disk? 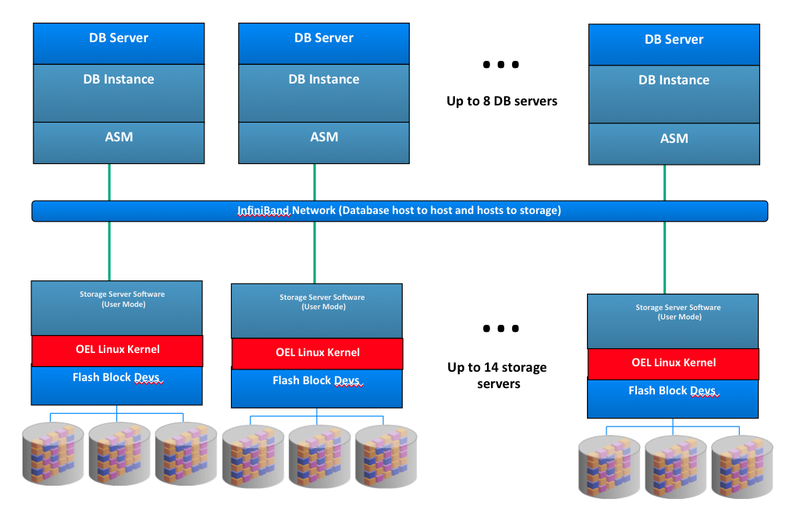 In this case two tiers of storage would exist inside the cell and with scripts the DBA could move (not copy) old data (partitions) out of flash and into disks as the space becomes needed for fresher data. As mirroring becomes needed to avoid loss of data in case of HW failure the amount of space useable in flash would be reduced compared to the cache use model but still it will be tiering albeit not automatic. Flash most certainly does not, however, *need* to be treated as block storage. Yeah, I probably meant to say “treated as SCSI block storage.” What I was trying to point out was that NVMe opens the future to accessing flash with memory semantics as opposed to physical I/O semantics while still allowing NVMe-specific HW to be grafted into the legacy SCSI data flow topology. And *indeed* today allows one to implement PCIe Flash storage without SCSI madness. In short, what I rant about is this notion that Oracle refers to blocks of disk copied into blocks of PCI flash accessed via legacy SCSI through physical I/O APIs as “In-Memory.” I presume you and I agree on how absurd a notion that marketing-misfire really is!